Four months after an initial meeting in the house of Andrew Smaha, on August 11, 1918 Frs. Peter Oleksiw and Nicholas Shumsky called an organizational meeting to form a Ukrainian Catholic parish in East Kildonan. Acting on the advice of Bishop Nykyta Budka, property at the corner of Watt Street and Montrose (now Larsen) Avenue was purchased for $1200. By July 1919, a small church (100′x25′) was completed. 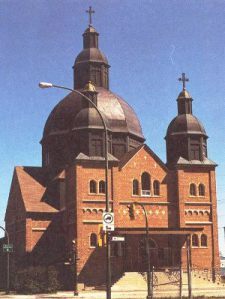 Holy Eucharist Ukrainian Catholic Parish, the third Ukrainian Catholic church in Winnipeg, was blessed by Bishop Nykta on October 29, 1919. The first parish priest was Fr. Michael Pelech. By the late 1940s, with the continued growth in the East Kildonan area, the church became inadequate to the needs of the growing congregation. A campaign was begun for a new church. Under the direction of the Fr. Ihor Shpytkovsky, a triangular parcel of land was purchased at Watt Street and Munroe Avenue, just a six blocks north of the first church building. The new church, designed by the the famous Belgian priest, Fr. Philip Ruh, OMI, was built in 1954.